To participate in the 19th English Alpine Championships, British competitors in age groups U14 and above must be registered with their Home Nation. All competitors must have a current insurance policy that permits them to ski race. The Organising Committee may require proof of insurance such as a valid governing body race licence or an independent certificate of insurance. The Organising Committee reserves the right to refuse entry to skiers who do not possess seed points and who cannot demonstrate a minimum level of competence. Suitable evidence may include previous race results or a Coach’s certification. For the FIS competition, if you enter all five English FIS races there will be a discount of £20. For U10/U12 the races will now be at least two runs and possibly three depending on the conditions. Cheques must be made payable to “Snowsport England” and sent to the Championship Race Secretary. An Entry List will be published on www.englishalpinechamps.org.uk and will be updated approximately every two weeks. Acceptance Lists showing entries received by the closing date will be published on www.snowsportengland.org.uk & www.britski.org websites by Wednesday 4th February (N.B. this Acceptance List will not be updated with late entries). THE CLOSING DATE IS MONDAY 2nd February 2015. By the closing date 372 entries were considered and accepted subject to FIS and British Competition Rules. Masters will be racing in the Senior categories for 2015, there will be no Masters trophies. The U16 and below will compete on the Adler Piste apart from the U16/U14 SL which will be in Bormio. The Organising Committee will consider late entries in all races received by 23.00h on Thursday 12 February for the races on Sunday 15 February and for all other races no later than 24 hours before the Team Captains Meeting. The English Alpine Championships kicked of with the opening ceremony at Bormio. The video of the ceremony can be seen by reading FULL POST. The athletes, parents and helpers, with the snow falling heavily, were welcomed by the Mayor of Bormio’s representative, by Tim Falke and Jeremy Eaton. The races start on Sunday 15 February with the U14 and U16 Giant Slalom on the ALDER race track. Best of luck to all the Hemel members taking part. The inaugural race of the championships was the Boys and Girls U14 and U16 Giant Slalom. Later in the day the FIS Slalom was held. The GS was held on the Alder Race Piste. The U14 course 1 was set by Rob Bullen and consisted of 44 gates with 40 turns. Course 2 was set by Mark Vinter and had 42 gates with 40 turns.The snow was reported as Firm with temperatures of just below 0c. For the U14’s the race consists of two runs, both are seeded separately. The U16 again consists of 2 runs but both are counted for seeding purposes. The U14 Girls started the 2015 Championships. Run 1 saw Sarah WOODWARD finish in 2nd place with Charlotte TAPSELL just over 2 seconds behind in 6th. Eleanor SCRANGE HARRISION, in one of her first alpine races, finish 8th followed very closely by Maddie BURNS in 7th. Anna CALDWELL was 12th. Nadine HUGEC completed the run in 18th position. Ellie ORCHARD in her first year of Alpine racing finished a credible 27th. In Run 2 Sarah WOODWARD dropped one place and was placed 3rd, Charlotte TAPSELL maintained her position in 6th. Maddie BURNS finished 8th, just ahead of Anna CALDWELL in 10th. Nadine HUGEC was 16th whilst Eleanor SCRANGE HARRISION was 20th. Ellie Orchard rose up the rankings finishing 20th. The boys competed on the same courses, the highest placed Hemel member in Run 1was Toby CASE in 14th. Charlie LEACH was 19th, Byron Appleton 29th, Charlie Humphreys 36th and Dominic BARTON 42nd. Unfortunately Hugo Warner dnf. In Run 2, on a slightly less turney faster course, Charlie LEACH was this time the highest placed Hemel member in 14th position. Byron APPLETON climbed four places and finished the run in 25th. Hugo WARNER had a better run 2 and completed the run in 39th position followed very closely by Dominic BARTON and Charlie HUMPHREYS in 40th and 41st positions respectively. The girls U16 race took place on the same piste, courses being used set again by Rob Bullen and Mark Vinter. Hemel member, Alicja KRAHELSKI finished top of the podium by 0.01s in 1st place. Shanna DANENBERGSONS was just under 4 seconds behind the winner in 5th place. Carys BOTY, making the transformation to snow racing, was 19th. Amy PETERSON was 22nd. A number of Hemel members DNF run 1, Nicole Sheering, Eleanor Trew, and Isobel Trew. Caterina Magenes, Meghan Davis dnf run 2. The boys U16 took place on the same tracks, Toby DEIGHTON being the highest placed Hemel member in 10th. Ed LODER finished in 12th and Harry DEIGHTON 16th. Patrick CALDWELL was 18th and Alfie GOSS, racing under the HEM banner was 21st. Dexter Lee dnf Run 2. The FIS race took place later in the day and into the night period, the second run starting at 1730h. . The race was on the Stelvio piste. As for all FIS slalom races both runs had to be completed for the results to stand. The courses were set by GBR coaches, Jo Ryding and Robin Kellen. Jo’s course had 53 gates with 51 turns. Robin set a slightly faster course with 51 gates and 49 turns. Yasmin COOPER and Anna HENDERSON tied in 13th place. Phoebe LONG finished 22nd and Amber BUCKLAND 28th. Masters racer, Avelline DEIGHTON finished the competition in 33rd place. Marie Curtis dnf run 2. The mens race, again held on the Stelvio piste, had courses set by Richard Breese and Marc Telling. Richard set 47 gates with 45 turns. Marc’s course was more turney with 53 gates, 50 turning gates. Kieran NORRIS had two good runs and finished 13th. Robert TREBILCOCK skied to his FIS points and finished 23rd, very closely followed by Oliver KRAHELSKI in 25th place. Daniel BARTON was 29th and Hemel Master, John NORRIS was 39th. Hemel members Oliver Deighton, dsq run 2, Joshua Penning Lambert dsq run 1. Robert Poth dnf run 2, Alex White dnf run 1. On a Sunny day in Bormio on the Alder Race Piste the U10/12 started their championships. The U10/12 compete on the stubby course, two runs with the best to count for the awards. The snow was assessed as FIRM, cold temperature of -4c. Club trainer, Alex Reidy set the course, 33 gates and 32 turns. At 1000h local, the girls started their competition of the Bormio English Championships 2015. All entries are randomly drawn. Molly BUTLER in the U10 category, racing under the HEM name, finished 2nd. Madeline FAIRFUL was 13th. The girls U12 saw Nia BOTY, after a successful summer season, compete on the alpine snow. She finished just under 9s behind the winner in 9th position. After the girls the boys took their turn on the same course. The sole Hemel U10 member taking part was Oscar LOUTH whose best time was 1:09.00 putting him in 14th spot. In the U12 boys Max FAIRFULL had a time of 00:59.67, 20th position. Whilst the U10/12 were competing on the Alder the older races were taking to the Stelvio race piste for the FIS GS. Two runs with both to count. The first courses were set by Spanish Trainer Pep Pujol and the second course by the Italian trainer Omar Anzi. Both courses had 36 gates with only 35 turns. Colder on the Stelvio at -6c because of the higher altitude start than on the Alder. Being I FIS race there were a number of International racers competing. However the event was won by a Brit, Cara Brown finishing just under 1.0s ahead of another Brit, Darcie Mead. The highest placed Hemel member was Phoebe LONG in 40th place. Amber BUCKLAND was 42nd and ever reliable, very rarely, if ever dnf Avelline DEIGHTON finished 47th. Seasoned racers Anna Henderson, Yasmin Cooper and Marie Curtis, along with 9 others, dnf Run 1. The men competed next on the Stelvio, two different courses set by brothers and academy rivals, GBR Trainers Paul and Marc Telling. Both brothers set 36 gates, 35 which were turning. Kieran NORRIS skied to his FIS ranking and finished 27th. Oliver KRAHELSKI now studying at university finished 37th ahead of Robert TREBILCOCK in 44th and Alex WHITE in 50th. Once again reliable Master, John NORRIS finished both runs placing him 57th. Daniel Barton and Josh Penning-Lambert dnf Run 1 whereas Robert Poth, after a decent first run, dnf run 2. English Alpine Championships – Bormio 2015 – Day 3, FIS SG, BARSC SG and U14/16 Slalom. On day a Sunny day 3 at the English Alpine Champs two speed events took place on the Alpine World Cup Stelvio Race Piste. This is acknowledged as one of the more challenging courses with an average drop of 38 degrees, steeper in places. Super-G, or super giant slalom, combines the speed of downhill with the more frequent turns seen in giant slalom. The course is shorter than downhill, but longer than giant slalom. Unlike in downhill, there are no training runs for super-G and skiers have just one run to impress. The winner is the racer who passes through all course gates and crosses the finish line in the quickest time. The absence of practice sessions makes the race-morning course inspection all the more crucial. The competitors assess how the course is set and memorise every ripple, roll, and turn. For the majority of the Hemel members taking part this was there first experience of a speed event. 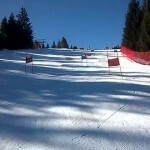 The FIS competition course was set by the GBR coach Marc Telling. It had 35 gates and 31 fast sweeping turns. Even though not starting from the top of the World Cup course there was a drop of 450m and speeds of 100kmh could be reached. The Snow was assessed as FIRM with the first athlete leaving the gate at 0930h local time. The girls started the event, the only Hemel member taking part in her first speed event was Amber BUCKLAND finishing in a time of 1:26.82 putting her in 32nd position. The men raced the same course with Hemel members Alex WHITE and Daniel BARTON finishing 49th and 51st respectively. In the afternoon on the same piste was the BARSC organised SG. The course was set by the Italian Trainer, Omar Anzi. As was for the morning course Omar set 35 gates and 31 turns. With the experience of the mornings race Amber BUCKLAND finished the run in 1:26.87, just 0.002s behind the morning time. This placed her 36th. With very similar times from the morning run Alex WHITE and Daniel BARTON finished 47th and 48th. Whilst these races were taking place many more Hemel members were taking part in the U14/16 Slalom event being held on the Stella Alpina course. The slalom is the most technically challenging of all, and putting a ski a fraction out of place can be the difference between a gold medal and instant disqualification. The slalom has the shortest course of the alpine skiing disciplines – but it also has the quickest turns. The U14 course was set by Norfolk and ERSA Trainer, Stuart Riches. With 57 gates and 55 turns this was going to prove a testing course. The girls opened the Slalom, Hemel member Sarah WOODWARD finished top of the podium beating her closest rival by just over 5s, a vast amount of time in ski racing. Madeline BURNS, almost 10s behind Sarah finished 6th. Nadine HUGEC and Anna CALDWELL raced neck and neck with Nadine just beating Anna in 9th and 10th places. Charlotte TAPSELL, who has spent most of the season out on the snow with Evolution, finished 12th. Eleanor SCRANAGE HARRISION finished very close to Charlotte in 14th. Ellie ORCHARD was 20th. The U14 boys competed on the same course set by Marc. Hemel member, Toby CASE, as in the girls event stood on top spot on the podium a much tighter event than the girls with Toby taking the honours by 0.50s. Charlie LEACH was the next highest placed Hemel member in 8th. Byron APPLETON was placed 15th, Hugo WARNER 27th and Dominic BARTON 34th. The U16 raced on the Stella Alpina race piste with James Knock setting course 1 and David Tee setting course 2.. Slightly less gates with James setting 56/55 and for run two David set a slightly more turney course with 58/56 gates. . As Hemel members did in the U14 event so we did in the U16. Alicja KRAHELSKI was on top spot in 1st position by over 7s from the second placed athlete. Shanna DANENBERGSONS finished the competition in 6th place. Nicole SHEERING, Caterina and Elise SNOW finished 14th, 15th and 17th respectively. Eleanor TREW was close behind the trio in 22nd. Unfortuantly Issy Trew and Carys Boty dnf Run 1. Meghan Davis dnf Run 2. In the boys event Dexter LEE was the highest placed Hemel member in a very strong field. Dexter finished with a time of 1:52.97 in 17th place. Harry DEIGHTON and Judson RABEY were seperated by 1.5s finishing in 28th and 29th. Alfie GOSS, under the HEM banner, finished 34th, Richard TREW 38th and Jason TARGETT 43rd. Toby Deighton and Patrick Caldwell dnf run 1, Ed Loder was dsq run 1. This evening saw the U14/U16 Team Parallel Slalom event, results below. An idea of what the race was can be seen in the video of the Dragons racing. Once more a sunny crisp day in Bormio. One of the newer events, the Combi, took place on the Adler piste for the U10/12. A combi event comprises of Rollers, Banks, Jumps, GS and Slalom turns, ie “All Mountain Skiing”. The idea of a combi event is to have fun whilst providing challenge and friendly competition. Two runs with the best time being used for the results. The U10 girls started the competition on a course set by TJ Baldwin, an ex international racer based at Norfolk. Molly BUTLER completed her run in 4th place, Madeline FAIRFUL was 12th. The U12 girls saw Nia BOTY finishing in 8th place. The boys competed on the same course as the girls. Unfortuantly in the U10 boys Oscar Louth dnf both Runs 1 and 2 as did Max Fairful in the U12 boys event. The final day of the English Alpine Championships saw some very good results from Hemel members. There were two SG races held on the Stelvio piste whereas the NJR Slalom swopped to the Adler race piste. The course for the first speed event race on Stelvio was set by Scott Bryson, 28 gates and 26 turns. In race 1 Hemel had 5 members in the top 10. Sarah WOODWARD continued her good championships and finished in 2nd place just under 1.0s behind the winner. Meghan DAVIES finished very close to Sarah in 4th place. Alicja KRAHELSKI was placed 6th and Shana DANENBERGSONS was 7th. Charlotte TAPSELL taking part in a unfamiliar event for her finished in 35th.followed by Caterina MAGENES and Issy TREW in 37th and 38th. Elise SNOW, again competing in the speed event for the first time, finished her run in 42nd. Nadine HUGEC finished 48th. Anna Caldwelldnf. The report will be updated if the final published results for the U14/16 girls are split. The boys event was held on the same course set by Scott Bryson. The results for this event were divided up into the age groups. In the U14 boys Charlie LEACH was the highest placed member in 11th position. Toby CASE in his first year of alpine racing finished in 14th, Charles HUMPHREYS was 29th and Dominic BARTON finished 32nd. Hugo WARNER was 38th. In the U16 boys event Toby DEIGHTON was 5th and his brother Harry DEIGHTON finished just under 2.0s behind Toby in 12th. Patrick CALDWELL finished his run 19th, Dexter LEE 23rd. Alfie GOSS, under the HEM name was placed 27th, Judson RABEY 34th. The second SG of the day followed on the Stelvio piste with the course comprising of 28 gates with 26 turns being set by Rob Bullen. The temperature for this afternoon race was unseasonaly high at 10c. This meant as the race progressed the course would be softening. The girls, as is tradition, raced first through the 28 gates. Charlotte TAPSELL took her experience forward from the 1st race and finished this event in 5th place, just over 2.00s behind the winner. Fellow Hemel member Madeline BURNS finished 0.05s behind Charlotte in 6th. Nadine HUGEC was placed 11th and Anna CALDWELL 14th. In the older age group, the U16 girls, Alicja KRAHELSKI finished 3rd, Meghan DAVIS in 5th and Shanna DFANENBERGSONS 8th. Issy TREW upped her ranking from the first race finishing this race in 19th. Caterina MAGENES was 24th. The boys then took to the same race course. Toby CASE was the best U14 Hemel member completing the course in 1:00.53s. This was over 6.0s behind the winner and placed him in 12th. Charlie LEACH was 17th and the only oher Hemel member finishing in the U14’s was Charles HUMPHREYS in 37th. Hugo Warner and Dominic Barton dnf. The boys U16 competed on the same course. Toby DEIGHTON, as he did in race 1, finished as the best Hemel member in 5th position. Toby’s brother, Harry DEIGHTON again as he did in race 1 finished 12th.Patrick CALDWELL, Dexter LEE and Alfie GOSS finished 25th, 26th and 27th respectively. Judson RABEY was 30th. Ed Loder dnf. The National Junior Slalom morning race swopped from the Stelvio and took place on the Adler piste. The courses for the ladies event were set by GBR trainers Marc Telling and David Mansfield. Marc set 58 gates with 56 turns. David’s was set with more gates, 60/58. Anna HENDERSON took advantage of the course set by her Alpine trainer, Marc, and finished 2nd Brit, 4th overall, Yasmin COOPER also had two good runs finishing 10th, 4th Brit. Phoebe LONG was 29th. Unfortunately Amber Buckland and Marie Curtis dnf run 2. The mens event was also held on the Adler, courses were set by Bulgarian trainer Ruslan Nachkov and GBR trainer Paul Telling. The first course had 61 gates, 59 turns and Pauls course was set with 63 gates, 61 turns. Rob POTH had two very good runs and finished highest placed Brit and 4th overall. Two tough courses with Oliver Deighton, Oliver Krahelski, and Kieran Norris dnf run 2.